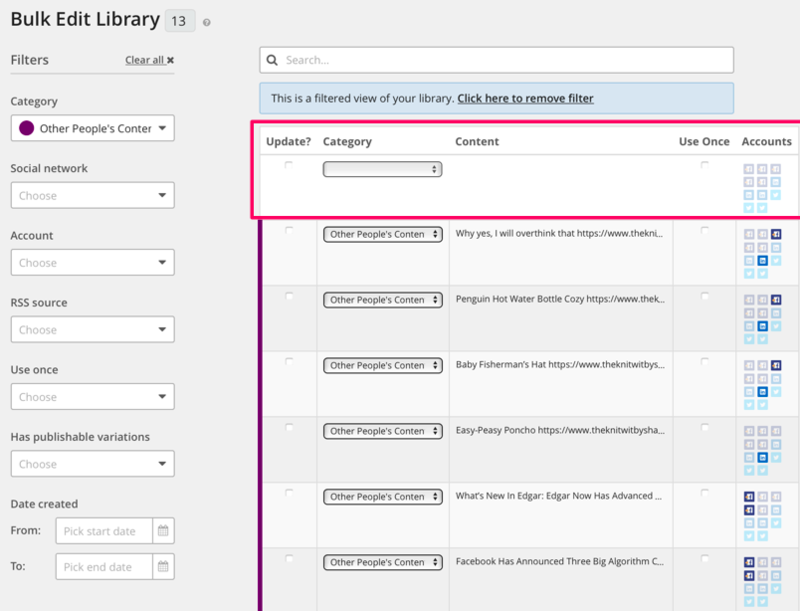 From the Library, click Bulk Edit to change the category or account associations of multiple posts at once, to delete multiple posts at one time, and to set multiple posts as Use Once. Both the Library and Bulk Edit contain the same filters. 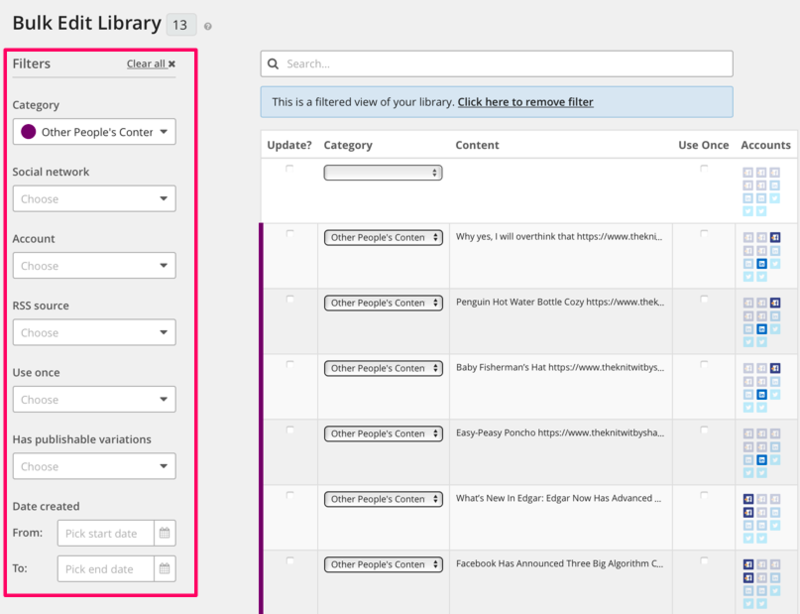 If you filter your Library and then click over to Bulk Edit, your filters will be retained. 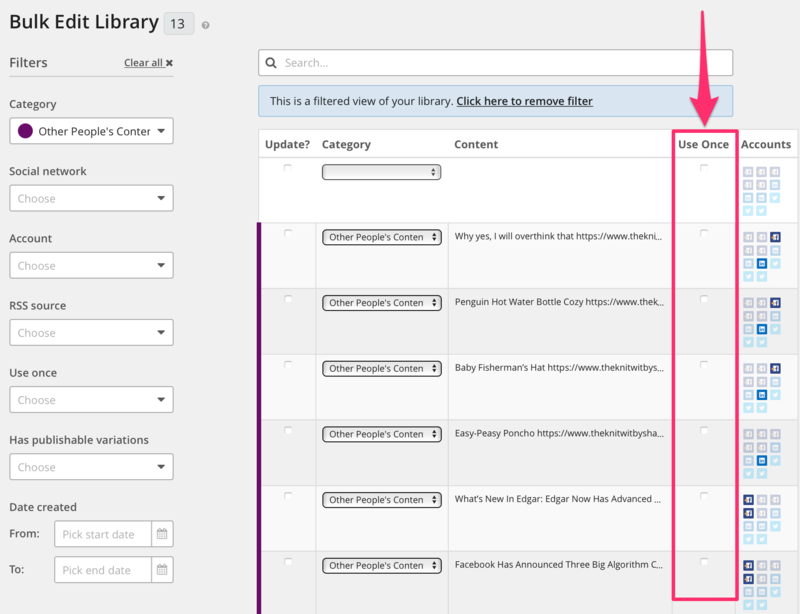 When making bulk edits, use the filters to narrow your results to avoid making unintended changes to your entire library. Changes or deletions made through Bulk Edit cannot be undone. Select your posts using the check boxes, and use the category drop down menus to change the category of your posts or use the account icons to change the social media accounts connected to your posts. When you're finished, click Update at the bottom. If you are using bulk edit to associate new accounts with your posts, there are some limitations. Specifically, posts may only be connected to one Twitter account due to their limitation on crossposting to multiple accounts.. Additionally, if a post is too long for Twitter or contains media not compatible with Twitter, Edgar will not be able to connect that post to Twitter. Posts that contain @tags for Twitter or Facebook pages can only be connected to those accounts as @tags are network specific. Posts with @tags cannot be connected to Facebook groups or LinkedIn. To delete more than one post at a time, select the posts you'd like to remove in Bulk Edit and click the Delete button at the bottom. Bulk edit also allows you to add or remove the Use Once designation on multiple posts. Select the posts you want to change and check or uncheck the Use Once box. When you're finished, click Update at the bottom.